Jakarta - Landslide victory over Rayo Vallecano Barcelona not only drove up to the top of the standings. Lionel Messi, who made a hat-trick in the game, now also be positioned above the top scorer, sharing the place with Cristiano Ronaldo. Barca started the match was not easy because in the first half they were only 1-0 through Luis Suarez. Vallecano gave fierce resistance in this first 45 minutes. New in the second half Barca rampage, with a total of five additional goals were created. Three of them made Messi within 12 minutes: starting 56 penalty minutes and two other goals in minutes 63 and 68. It is the fifth hat-trick made Messi in La Liga this season. Four hat-trick before he made when dealing with Sevilla, Espanyol, Deportivo La Coruna and Levante. The three goals while making Messi now has a collection of 30 goals. The amount is equal goals of Cristiano Ronaldo, and make both of them for a while sharing the most fertile place as a player. This condition makes the battle for El Pichichi will be increasingly fierce competition in the last 12 weeks. At the beginning of last season Messi looks to be very difficult to compete with Ronaldo in the race for top scorer status. Even to the last three months there were 13 goals so distinguishing between the two. On December 13, 2014, Ronaldo has to make 25 goals while new Messi 12. 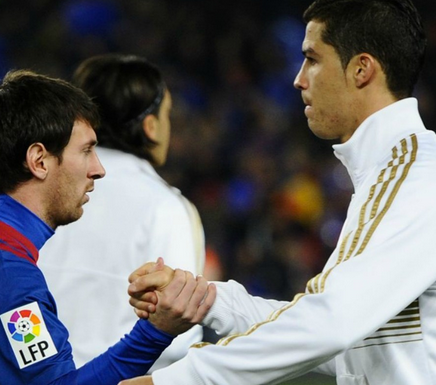 As of 22 November 2014 the distance even further: 20 to Ronaldo and seven for Messi. But after the turn of the year Messi shot with his goals. A total of 15 goals made Messi in 2015, and recorded only two games he did not make a goal (Real Sociedad and Malaga). While since the new year the number of goals Ronaldo only making five goals.